File file: .mshc -- Simple pkzip file renamed to .mshc. Project files: None. Just zip content. Topic HTML files contain TOC & Index definitions as meta tags. Runtime: VS 2010/2012 help; Windows 8 OS/OEM help. MS Help Viewer ships with Visual Studio 2010/2012 and above. The .mshc help file format is a simple .zip file containing HTML based topic files as well as other help content such as images, script and CSS files. Table of Contents and Index items are defined using Meta statements in the topic file headers. MS Help Viewer 1.0 (VS 2010) uses a unique REST API to access topics. A Windows tray application (Help Lib Agent) is used to run the system. 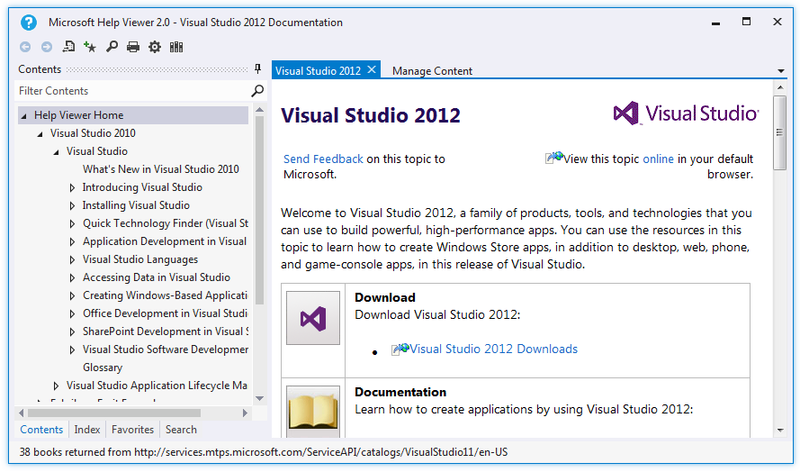 MS Help Viewer 2.0 ships with Visual Studio 2012 as well as the Windows 8 OS. HV 2.0 kept the same .mshc help file format but has a brand new help engine. The 2.0 help system uses a standard COM API and there is no more "Agent" tray application. It is not permitted to install the help runtime separate from VS or Windows 8. Win 8 help and VS 2012 help runtime have identical code but with different DLL file names to keep the systems independent from each other. Also only VS ships with a full help file viewer. Windows 8 has it's own simple viewer used for OS and OEM help.